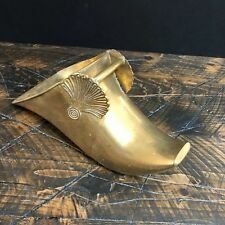 Peacock brass shoe horn collectable. Condition is Used. Dispatched with Royal Mail 2nd Class. POPLAR LONDON VERY OLD Hand Made Brass Some real age to this one!, a great little find. Sits about 5” inches height. 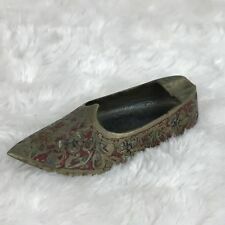 BOOT SHOE Vintage Antique Model Ornament looking at age/design I’m believe it to be from around the Victorian era. says “Poplar London” in it Condition is Used questions welcome Dispatched with Royal Mail 2nd Class. Vintage Brass Shoe Horn golf club shape. Very nice shoe horn lovely to use. Condition is Used. Dispatched with Royal Mail 2nd Class. Great Vintage Brass Pig Tail Shoe Horn - 17cm. Condition is Used. Vintage Brass Shoe Horn . With Squirrel & Hanging Ring. Condition is Good Used. Dispatched with Royal Mail 2nd Class Large Letter. Two are 50 cm long, the Isle-of-Man one is 43 cm long. All in very good condition. Great Vintage Brass Pig Tail Shoe Horn. Condition is Used. Would make a nice addition to a brass collection. Be sure to add us to your favourites list ! Height approx 6.5cm. It is slightly bent due to previous use. Brass is intact and shinny. So a bit of wear is to be expected. Approximate weight: 100 grams. I will do everything in my power to make sure you have a pleasant experience. Brass shoe horn in good condition. Spaniels shoe horn 18.25" long & birth place of Robert burns toasting fork 19.5" long as seen in photo's. Brass Shoe With Mouse. Condition is Used. Dispatched with Royal Mail 1st Class. Vintage Brass Shoe Horn Cutty Sark. Vintage brass shoe horn with Cutty Sark on handle. 8 inch long. IT HAS A HANGING LOOP. SCREWS BACK TOGETHER EASILY. 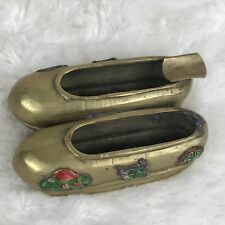 Unusual Vintage Chinese Brass Shoes. Beautiful Crisp detailing. Condition is Used. Approx 4½" X 1½" X 1½" ( 11 X 4 X 4cm). Aged---needs a clean, 19cm long. A Vintage Brass Shoe Horn with the emblem on Norwich on the handle. It measures at approx 6.5” and is in good condition with no damages. The brass has some minor markings from age and use over the years. Please see the pictures for a closer inspection and feel free to check out my other items. From a pet and smoke free home. Vintage Solid Brass Ladies Victorian High Button Boot Shoe 6"